Stern, sharp and shrewd, Narendra Modi fought his way off the streets to become one of India’s most popular and polarising prime ministers. There is no middle ground between admirers and adversaries of the man — now running for a second term as leader — who helped his father run a railway station tea stall before launching his career in nationalist politics. The 68-year-old makes much of his humble roots while unashamedly portraying himself as the tough guy protecting India’s national security and Hindu values, pressing its claims to be the world’s rising power. Doubts have been expressed over his economic reforms and businesses still complain about the sudden cancellation of high-value banknotes in 2016 in a bid to combat the black market economy. But little mud has stuck and few dispute that “NaMo”, as he is known, drives India’s national agenda while expertly baiting neighbouring Pakistan and the opposition Congress party, especially its leader Rahul Gandhi. And audiences love the Modi spectacle. His Twitter following of more than 46 million makes him one of the world’s most-tracked leaders. With his neat white beard and a vast collection of headgear, Modi regales rallies with stories of how he is “a son of soil”, contrasting himself with Gandhi as a spoiled member of the dynasty that has dominated India since independence seven decades ago. “They dislike me because of my humble origins. Can a party stoop so low?” he said at one event. Narendra Damodardas Modi is said to have joined the Hindu hardline Rashtriya Swayamsevak Sangh (RSS) nationalist group at the age of eight and left home as a teenager, abandoning a marriage arranged by his family, to become an RSS activist. An assiduously hard worker, Modi rose through the ranks of the RSS and its partner Bharatiya Janata Party (BJP) to become chief minister of his Gujarat home state in 2001. Bolstering the Gujarat economy and espousing outspoken nationalist causes provided the launchpad for him to lead the BJP into the 2014 general election. The country was seduced by his story and the party won the biggest landslide in India’s history, decimating Congress. Modi is not without shadows in his history and chinks in his communications defences. After a train carrying Hindu pilgrims caught fire killing about 60 people in 2002, riots broke out that left at least 1,000 people, mainly Muslims, dead. Modi was accused of complicity in stirring up the riots but two courts found there was no case to answer. Sometimes Modi’s comments come back to haunt him. While campaigning in 2014 he claimed to have a “56 inch” muscle man’s chest to make tough decisions. His opponents and comedians still mock him as “Mr 56 inch”. Journalists have a difficult time as Modi has never given a press conference as prime minister and critics say his rare television interviews are carefully stage-managed. Rahul Gandhi regularly hits out at what he calls Modi’s “autocratic backlash” since taking power. “Mr Modi believes that he is the lord of India, just like the British believed,” Gandhi said. 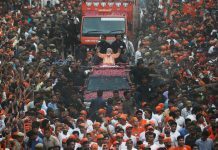 Modi’s personalised politics will be the “defining” issue of the Indian election, even his party admits, while many experts say that Modi is carrying his party through this election. “Take away Modi and 90 percent of the speeches of the opposition leaders would be over,” Finance Minister Arun Jaitley told the Indian Express in an interview published Monday. Modi can be compared to India’s founding prime minister Jawaharlal Nehru in his ability to dominate the conversation, according to Harsh Pant, an international relations professor at King’s College in London. Pant and others say however that Modi’s real impact will only be revealed if he can secure and complete a second term in power.